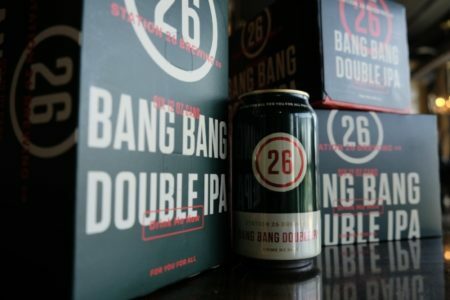 Station 26’s aggressively hopped Double IPA, Bang Bang hit the brewery’s Park Hill tasting room last month as a new addition to its core line of beers, and is now available in 6-packs of 12 oz. cans across the Denver Metro area and Boulder. Bang Bang Double IPA is hopped with Amarillo, Mosaic, and Simcoe hops that yield flavors of orange peel and Meyer lemon. This bold, 9.2 percent ABV beer balances out with a dry, refreshing finish. Station 26’s canned beer family also includes Juicy Banger IPA, Colorado Cream Ale, Tangerine Cream, and American Copper. For more information about Station 26, contact Emily Hutto at coop@radcraftbeer.com. ABOUT STATION 26 BREWING CO.
Station 26 Brewing Co. brews craft beers in a 1960 fire station in Denver’s Park Hill neighborhood. The brewery was founded in 2013 by Justin Baccary and friends. It’s an ideal first stop for travelers coming from Denver International Airport. Find the brewery online at www.station26brewing.co.